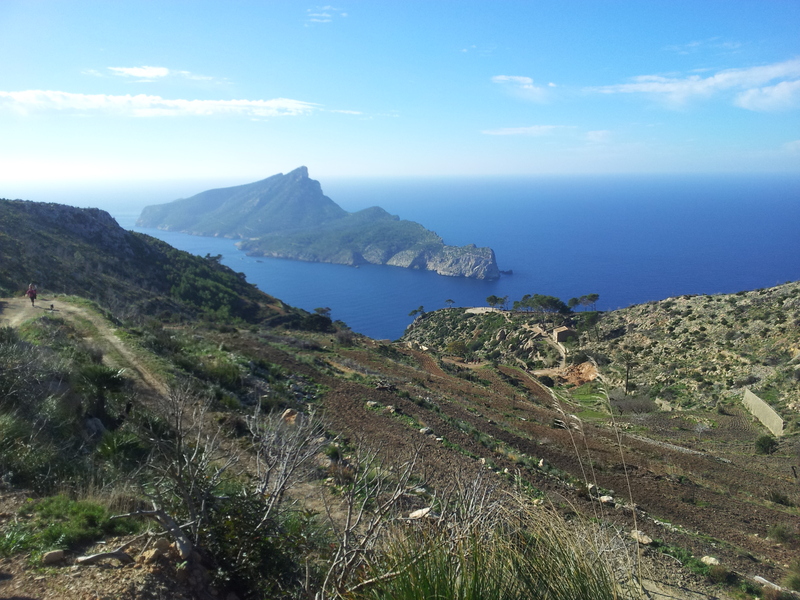 About a month ago my daughter, La Gidg and I went walking from Sant Elm up to the top of Sa Trapa and back down again. My husband was in Pollensa photographing a cycling team so we were one man down in Team Neilson McLeod, but that didn’t matter as we were out with a bunch of friends. There were about twenty of us when we set off from Es Moli on that sunny Sunday morning, plenty of grownups, kids and dogs. If you’ve ever done the walk you will know that there are some steep and demanding parts of it, but that it’s worth the “up” as the view at the top is quite amazing. You can see over to the island of Dragonera and back over the hilltops to Port Andratx and to s’Arracó. We stopped at the peak and had a snack. Everything was very jolly and we were feeling quite pleased with ourselves that we had got out of the house and conquered that climb up. Then as we were making our descent towards the Sa Trapa buildings La Gidg slipped over. It was quite a heavy fall, and there were tears. I could see that there was some blood coming through her leggings but because they weren’t torn I assumed that it was a graze. She didn’t want me to look at it (she is quite strong headed, a bit like her parents) so I decided that the best thing was to get back down to the car as soon as possible and then get ourselves to a doctor if we decided we needed one. There then followed two excruciating hours of slow hobbling down. In hindsight I should have insisted that I looked at her injury, and if I had seen it, I would have been on the phone to the emergency mountain rescue. When we made it back to the car we went straight to the local PAC in Andratx. When I finally saw what had happened to my little girl’s leg and appreciated the level of bravery that she had shown getting down from the very top of Sa Trapa back to Sant Elm, I have to say I was completely speechless. Her leg, despite no damage to her clothes, was cut from one side of her knee to the other, about 10 centimetres and about 4 centimetres wide. It was as if special effects makeup artist had been practicing on her. “Go to Hospital Son Espases” was pretty much the decision, and once she had had a quick clean-up and a sterile bandage applied we went in to Palma where we were seen very quickly. We were spoken to in English by our doctor when it became clear to him that I was in too much of a state to really concentrate in Spanish and then La Gidg, with the help of two doctors, three nurses and a bottle of gas to relax her, had fifteen stitches put into her leg, and goodness knows how many more inside. I know I moan about the cost of social security in Spain, and the unfairness of the system for autonomos and small businesses but I cannot fault the hospital system. It was very good, efficient, well equipped and there when we needed it. The after care has been great as well. Gidg just had her stitches out last week, and we are still some way from Hip Hop and Cross Fit classes, but her leg is still attached to the rest of her which makes us all grateful for small mercies. I met Mariella Echeverri this week. She is the co-ordinator responsible for the One Billion Rising event in Palma which has happened for the past two years, and this year’s is going to be even bigger she says. One Billion Rising is a campaign to raise awareness for the continuing worldwide issue of violence against women. It’s an opportunity for women and men to stand together and demand change. Here in Mallorca there will be a demonstration, gathering and public party on Saturday 14th February during the day in Palma de Mallorca. There will be representatives from women’s groups in Majorca, and Mariella hopes to have representatives from many of the official bodies as well. We meet in a cafe, Mariella and I huddle over steaming hot coffees whilst Palma shivers. What do you want to achieve from this? I ask her. “I want people to come away from the event asking, how can I help locally? Can I help my sister, my cousin, my neighbour? The real problem is that it is very difficult to get to the women who are already at risk, they are so scared and caught up in their situation they don’t know how to get out of it”. I ask Mariella why she organises the event every year, “I do it for my daughter. She is five. I want her to know that there is another way.” We talk about how even young girls are being pressured and influenced through social media and text messages, you don’t even need to be in the same room. “Young men are controlling their girlfriends by making them give them their passwords for Facebook, they are saying ‘if you love me then you will let me know everything about you, let me take that photo of you, it’s just for me, and they’re going to show their friends and bully and harass their girlfriends that way”. And then of course there is the use of physical, and sexual violence against women to control and subjugate them around the globe. If you want to stand up and show support for women across the world, and demand the end of violence against women then please attend the event. It will happen on Valentine’s Day, Saturday 14th February. 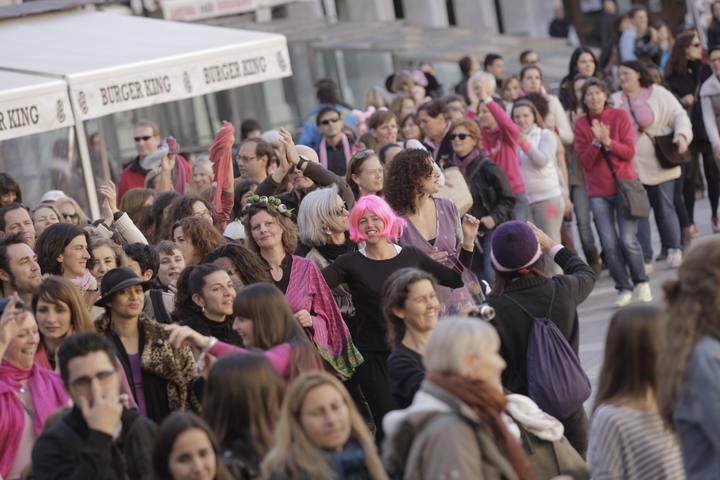 They will meet at 11.30am in Plaza Cort and then walk, dance, run, sashay and march to Parc de la Mar. Mariella’s hoping they will be accompanied by motorbikes to “Make some noise” then then once the group arrive at Parc de la Mar (in front of the Cathedral) there will be a huge Zumba event, speeches and chances to get information. Will you be one of the Billion Rising? I hope I will see you there.